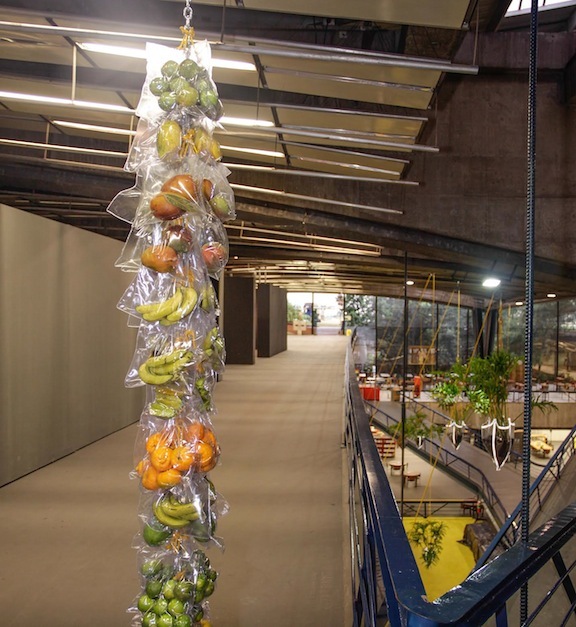 A column made of decomposing tropical fruits wrapped in plastic bags greets visitors to Daniel Lie‘s site-specific takeover of all three floors of the Centro Cultural São Paulo (CCSP). The exhibition title, “Pact with the Future,” is ambiguously optimistic in its nod to mortality and procreation, especially in the Darwinian sense. Lie’s plant-based sculptures suggest that the point of life lies in its future, as those lifeforms aim to nothing but the endurance of their own species. For a human viewer, aware of death, Lie offers little more than hope in the form of a metaphor: an elaborate pulley system installed throughout the building that rigs up fruits and plants. 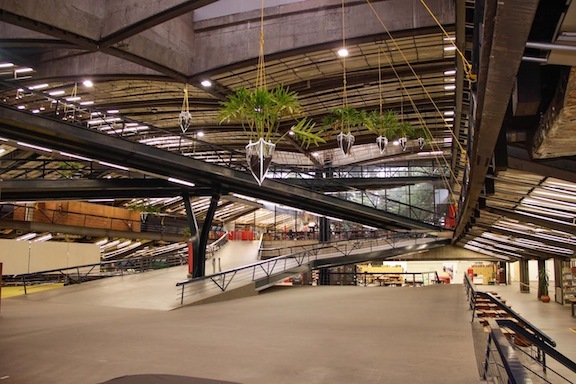 Lie’s time-sensitive, multi-floor installation of living plants that hang from the ceiling in the empty space between the building’s ramps create a floating forest. Down in the library, big pieces of Brazilian crystals hang from a similar structure, connecting the building’s bottom floor to its ceiling, trespassing all the exhibition levels. Lie explored the building well: while the plants are from CCSP’s original landscape project, the whole of the installation is dependent of the architecture. Despite its three-dimensional character, the lines created by the yellow ropes, and complemented by the yellow signalization on the floor, allude to drawing, the artist’s first medium. But more than creating a beautiful visual effect, “Pact with the Future” manages to level opposing disciplines and concepts. A mathematic mechanism is used to create an artistic piece; human-made and environmentally questionable plastic bags sustain natural material, be it vegetable or mineral. The structure created by Lie unifies rational precision and organic outburst—much like life. “Pact with the Future” shows through August 9, and is the second part of a trilogy of simultaneous exhibitions held by the artist, all of which relate to the issue of time. 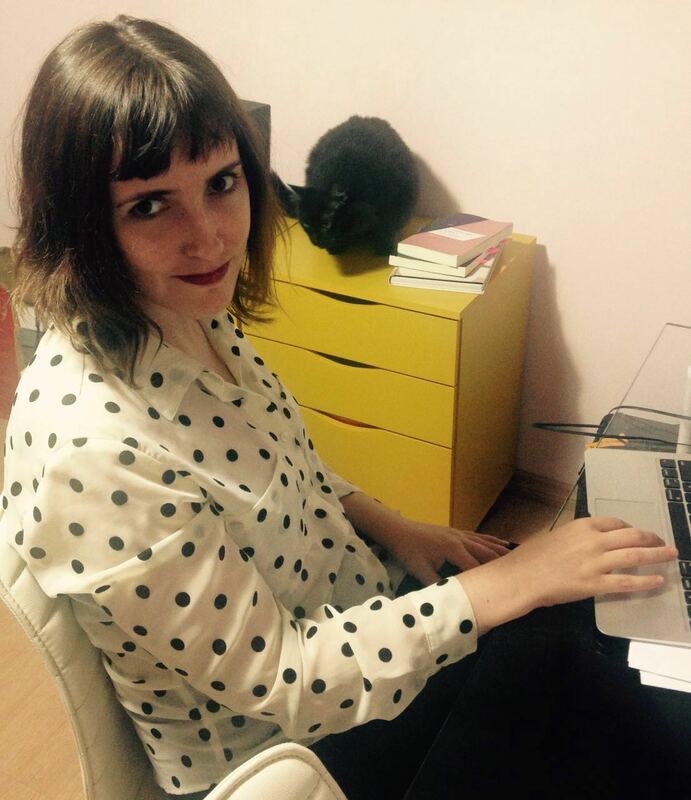 The first one, “Meus sentimentos,” is on view at the Oficina Cultural Oswald de Andrade, and the third, “Lie Liong Khing,” at Casa Triângulo.